In these classes children, parents and carers can spend quality time together playing and connecting while developing body awareness, strength, balance, flexibility, coordination and self-confidence. Family yoga classes incorporate music, stories, singing, dress-ups, dancing, games, yoga poses, massage, breathing and relaxation, and are fantastic fun! Ideal for kids between approximately 2 - 10 years old and at least one adult. You don’t need any prior yoga experience to come to these classes – just be ready to play! Sunday 10th March 2:00 - 3:00pm - Let’s make Magic! 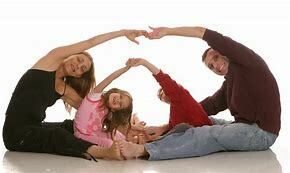 Family yoga workshops are $30 per family up to 4 people. $5 per extra person. Please email Lisa to book your family’s spot at our next workshop!